As North America experienced one of the coldest winters in recent history, University of Maryland researchers were surveying the skies above the tropical western Pacific, collecting data that will yield clues about the effects of human activity and ocean biology on the composition of the atmosphere. The research team included two graduate students and Professor Ross Salawitch, who holds appointments in atmospheric and oceanic science, chemistry and biochemistry, and the Earth System Science Interdisciplinary Center. The researchers traveled to Guam, an island in the Pacific Ocean 3,300 miles west of Hawaii, where the world’s warmest sea surface temperatures lead to the most active cloud systems on Earth. During the winter months in the Northern Hemisphere, the combination of heat and moisture in the region causes warm air to rise from the ocean’s surface, creating a chimney effect and feeding into huge clusters of thunderstorms. The storms lift gases and particles through the low levels of the atmosphere and into the stratosphere, where they can spread over the entire planet, linger for long periods of time, and influence atmospheric climate and composition worldwide. As co-principal investigator of the CONTRAST (CONvective TRansport of Active Species in the Tropics) field project, Salawitch helped lead a series of intensive data-gathering flights by three aircraft, the most comprehensive data collection effort of its kind in the region. Salawitch served as mission scientist aboard the HIAPER (High-performance Instrumented Airborne Platform for Environmental Research) aircraft, a Gulfstream V jet sponsored by the National Science Foundation (NSF) and the National Center for Atmospheric Research (NCAR) and modified for advanced research. HIAPER flew at altitudes between 500 and 48,000 feet, along with NASA’s Global Hawk, a robotic air vehicle that studied upper-atmospheric composition primarily between 45,000 and 60,000 feet. The British Facility for Airborne Atmospheric Measurements’ (FAAM) BAe-146 research aircraft conducted extensive sampling near the ocean’s surface. 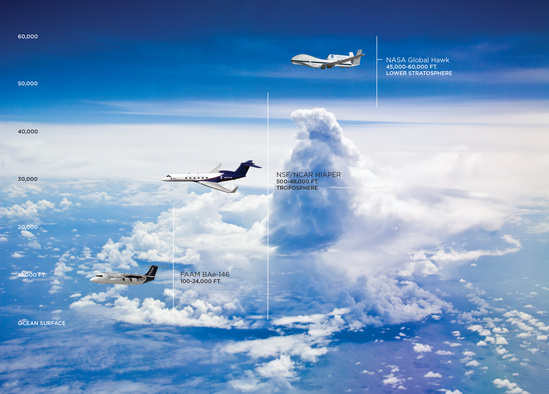 Taken together, the data collected by the three aircraft will give research collaborators a detailed view of air masses spanning tens of thousands of feet from the ocean surface to the stratosphere. gas chromatography, mass spectrometry and absorption spectroscopy, required small, autonomous hardware packages designed specifically for the HIAPER platform. Two instruments onboard HIAPER measured organic halogens (chemical compounds with the carbon-bromine bond intact) and two other instruments measured inorganic halogens (chemicals produced once the carbon-bromine bond has been broken). “We can map the transformation of these chemicals to quantify how ocean biology affects the stratosphere,” says Salawitch. 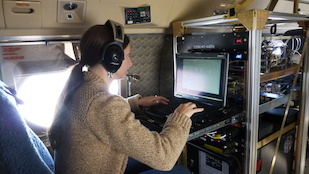 Julie Nicely, a graduate student in chemistry, served as mission coordinator on one of the flights and played a critical role in charting the plane’s course to optimize the collection of samples. “As we were flying and seeing firsthand the change in air quality, we were able to perform real-time analysis to help us better understand the chemical features of the atmosphere,” says Nicely, who also assisted with chemical forecasts and analysis for the entire campaign. Though data analyses are far from complete, Salawitch reports a major surprise. “There was a significant amount of pollution in the atmosphere over Guam. We know this pollution is not coming from Guam and that a pervasive amount is coming from upwind areas. We will be building trajectory models to study the type of pollution and determine where these air masses originated,” he explains. Project findings will result in a new data set for evaluation of climate-chemistry models for a previously untested region of the world. “Our data will feed into the work of the air quality community, the climate community and a whole body of chemists eager to see what we have found,” says Salawitch.